There are a plethora of fun things to do in St. Thomas, US Virgin Islands, that range from sunset cruises to snuba diving to snorkeling with turtles to just relaxing on a white sand beach. When you arrive on St. Thomas, you will thoroughly be pleased with the selection of excursions you and your family can enjoy. Other interesting options include kayaking to Hassel Island or stand up paddleboarding in Brewers Bay to an incredible learning experience at Coral World Ocean Park. Your family will be happy walking the streets of Charlotte Amalie while learning about the Dutch-colonial architecture of the city as well as going to the top of Blackbeard’s Castle for splendid panoramic views of the island. Whether you are looking for water adventure at Mangrove Lagoon or sitting on Drake’s Seat and watching the scenery, you can find the perfect St. Thomas activity for the whole family to enjoy. If you like to learn about the culture and history of the places you visit, the perfect thing to do in St. Thomas is to go on a St. Thomas Island Sightseeing Tour. You have incredible options for excursions that will take you to places like Mountain Top, 99 Steps, Market Square and the historic city of Charlotte Amalie. Other exciting sightseeing options have you shopping in the morning and lounging on Magens Beach in the afternoon or snorkeling with turtles at Coki Point Beach. 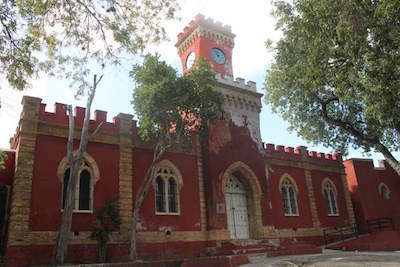 The rich history of St. Peter Great House and Botanical Gardens are superb as well as the story behind Bluebeard’s Castle and Fort Christian. Most excursions are family-friendly and you have a variety of choices from half to full-day tours that may include lunch or a snack. So whether you are looking to shop, explore nature or just kick back on the beach, there is a perfect thing to do in St. Thomas for you. 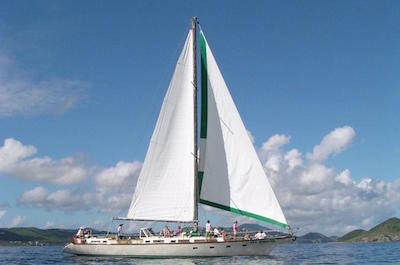 One of the more popular things to do in St. Thomas is to go cruising, sailing or on another type of water tour. You will be pleased with the variety of choices for you from a fabulous sunset cruise with dinner to partying on a catamaran to taking a powerboat out fishing. Other options you can include in a cruise, sailing and water tour in St. Thomas are snorkeling, a trip on a semi-submarine as well as sailing a luxury yacht. 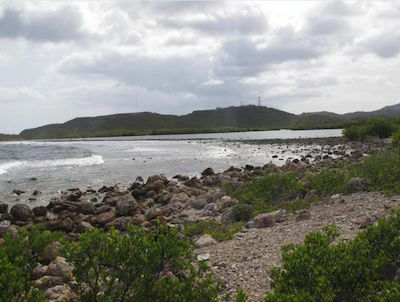 You can visit such stellar natural spots as Buck Island National Wildlife Refuge, Cruz Bay and to several lightly inhabited cays. 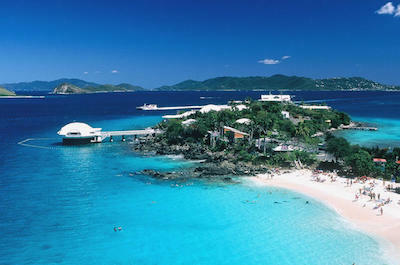 The options are limitless and you can even travel to the British Virgin Islands. You can select the amount of time you want to spend from 2-hours to a full-day tour of the surrounding blue waters. These excursions are a great thing to do in St. Thomas for families to bond and enjoy their vacation. One of the most popular things to do in St. Thomas is to take an eco-adventure kayak tour that puts you right in the middle of nature. You have a wide variety of excursions to select from that include a trip through the Mangrove Lagoon, a paddle to nearby Hassel Island as well as a cruise to a secluded beach where you can snorkel with sea turtles. Other options include a night time excursion to Mangrove Lagoon or Pirates Point and you there is a glass-bottom kayak for extreme marine life viewing at Coki Point Beach. Kayaking is a great way for families to have fun and with the many add-ons like snorkeling, hiking or bird watching; you will have no problem finding the perfect kayaking excursion that will leave lasting memories in your mind. One of the best things to do in St. Thomas is to try a snorkeling excursion and view some of the most colorful coral reefs as well as marine life in the world. You will be happy to find out the variety of choices you have for snorkeling tours. You can decide to go snorkeling off of Coki Point Beach, swim with turtles at Trunk Bay or enjoy the crystal clear water off the shoreline of Brewers Bay. Snorkeling is a great way for your family to get out into nature and experience the underwater world that surrounds St. Thomas. You will be amazed at the variety of tropical fish as well as the size of stingrays and the beauty of the coral reefs. You can add a variety of other options like a catamaran sail to kayaking to stand up paddleboarding which will help your snorkeling adventure to be a forever lasting memory. Scuba diving is one of the more interesting things to do in St. Thomas that will put you in touch with nature within the underwater world that surrounds the island. There are a plethora of scuba diving tours that can accommodate novices to experts looking for that premier place in the world to dive. 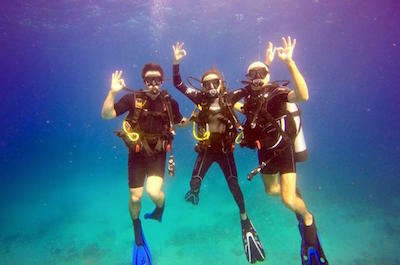 You can take an introductory course or get certified while you are scuba diving in St. Thomas. Other options include one and two tank dives that are perfect during the morning and you can even take a thrilling dive at night. You will enjoy the beautiful coral reefs around the U.S. Virgin Islands as well as learn more about the fragile eco-system of the ocean world. So whether you are a beginner or expert, you will find the right place for you to enjoy a wonderful day of scuba diving. If you have ever wanted to ride in a submarine but did not want to be completely submerged, then the best thing to do in St. Thomas is to ride on the Semi-Submarine Cruise. Your one hour adventure begins when you arrive at Coral World Ocean Park on the eastern end of the island. From here you will board a semi-submarine which gives you a front row seat into the underwater world of St. Thomas. As you cruise along Coki Point you will be amazed at the brightly colored tropical fish, sea turtles and stingrays you will watch swim in their natural habitat. You can view the action from the underwater cabin or on the monitors that feature the Live Dive Cam which is operated by an expert diver. An added bonus to this adventure is a general admission pass to Coral World Ocean Park. Within the park you can explore 21 different tanks of varied tropical underwater habitats along with other exhibits for sea turtles, sharks and stingrays. You can also just relax on Coki Point Beach, which is a popular thing to do in St. Thomas, or go swimming or snorkeling just offshore. You can spend as much time within Coral World Ocean Park as you wish and your tour concludes when you have had a fabulous day. When you want to learn about the history of the island and even indulge in a little rum, then the best thing to do in St. Thomas is to go on a cultural and historical tour of the island. You will be thrilled with the variety of cultural and historical tours on St. Thomas that include visiting such stellar places as the 99 Steps, Blackbeard’s Castle and the wonderful Dutch-Colonial architecture within the city of Charlotte Amalie. 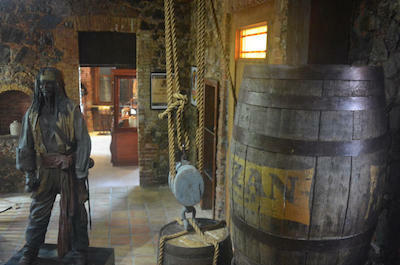 Other options include rum tastings, a tour of the Haagensen House and a fabulous look at the pirate gallery. While on your cultural and historical tour you can mix and match some of your favorite activities such as shopping at the numerous duty-free shops or visiting the white sands at Magens Bay Beach. No matter which tour you select you are bound to have a good time while learning something interesting. If you want to see more of the Virgin Islands then the best thing to do in St. Thomas is to take a day trip to St. John’s, Jost Van Dyke or another Virgin Island. 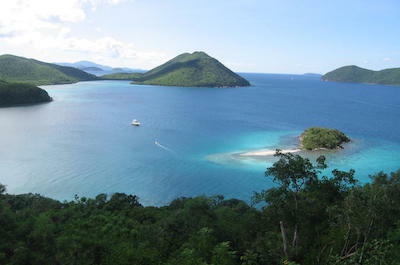 You can travel to St. John on ferry, to Jost Van Dyke by speed boat and the British Virgin Island by sail boat. You can decide to spend all day at Trunk Bay Beach snorkeling or visiting Cruz Bay Beach and there are options to spend the day at White Bay. You can choose a more intimate group setting or a larger party atmosphere and most excursions are family-friendly. Whether you want to spend the day on Virgin Gorda visiting the Baths or on Jost Van Dyke relaxing on a hammock or watching turtles swim by at Cruz Bay, there is an ideal day trip planned for you already. One of the more popular family-friendly things to do in St. Thomas is to take the kids on a Sea Lion Encounter at Coral World Ocean Park. Your adventure has varied start times allowing for easy access to families. Once you are at Coral World Ocean Park you will check-in and listen to an informative talk on the challenges the South American sea lions face by your expert guide. From here you will go to the sea lion pond where you will have plenty of chances within 20-minutes to play, pet and feed the sea lions. You can play soccer, give them a kiss and interact with the sea lions on land as well as in the water. An added bonus on this excursion is a day pass to Coral World Ocean Park. You can take your time as you stroll through the park viewing the 21 water-based exhibits that range from an undersea observation tower to a Caribbean reef to shark shallows where you can actually touch the sharks. 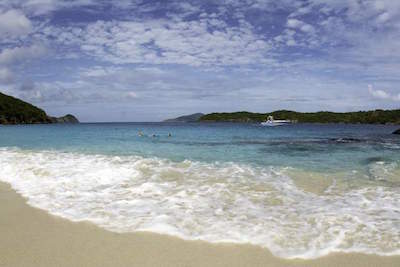 You can go snorkeling at Coki Point Beach or just lounge on the soft white sand. You can control your day and the time you spend at each exhibit to make for a remarkable and memorable day at Coral World Ocean Park. 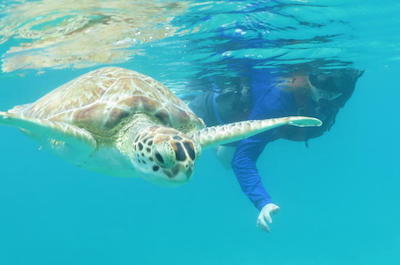 When you want to get up close and personal with sea turtles, then the best thing to do in St. Thomas is to book a turtle encounter tour at Coral World Ocean Park. Your adventure is flexible and once you have checked in you will meet your expert biologist guide. During your turtle encounter you will learn about the habitat, life cycles and the problems green sea turtles face on a daily basis from hunting to pollution to loss of habitat. After your orientation session you will enter the outdoor turtle pool which is filled with waist deep water. Here you will meet and greet two green sea turtles. 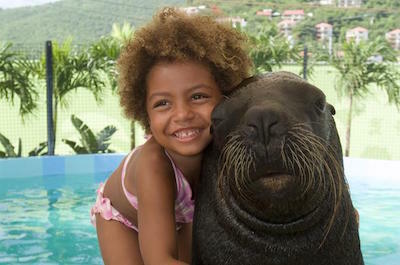 You will enjoy petting, swimming and majestic appeal of these marine animals. 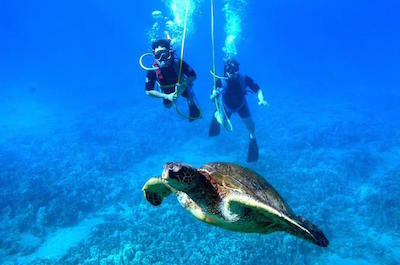 Your turtle encounter adventure does not just stop with this experience. When you are finished with the sea turtles you have complete access to Coral World Ocean Park where you can view over 21 interactive exhibits on marine life. There are also opportunities to enjoy lounging on Coki Point Beach as well as snorkeling or swimming just off the shoreline. The turtle encounter excursion and day pass to Coral World Ocean Park is a fabulous thing to do in St. Thomas for your family to bond while spending the day in great learning facility. When you are looking for a unique underwater experience, then the ideal thing to do in St. Thomas is to go Snuba Diving. Your 30-minute adventure begins when you arrive at Coral World Ocean Park and meet your snuba certified instructor. You will be given a quick briefing on safety and how to use your snuba equipment before you board your boat that will take you out on the water. While snuba diving you can experience the thrill of being underwater like a scuba diver and without the hassle of being certified as you view incredible marine life in its own natural habitat. Your snuba diving adventure concludes when you return to shore at the Coral World Ocean Park. An added bonus is you have access to Coral World Ocean Park with 21 stunning exhibits on the eco-system of the surrounding Caribbean Sea as well as a day pass to beautiful Coki Point Beach. This combination makes for a great day excursion with the family without a lot of traveling around the island. One of the most popular things to do in St. Thomas is to take your family to the Coral World Ocean Park on the eastern end of the island. Located adjacent to Coki Point Beach, Coral World Ocean Park is a fabulous learning adventure which highlights the islands natural eco-system both on land and water. Coral World Ocean Park has 21 interactive aquariums that allow you to view hundreds of species of marine life. You can pet a shark, play with a sea cucumber and even swim a sea lion as there are plenty of other added options once you are at the park. Your general admission ticket also includes a day pass on Coki Point Beach which is a wonderful stretch of white sand with superb snorkeling just offshore. Your family will be amazed on the number of activities and learning stations that help create added value for your experience at Coral World Ocean Park. 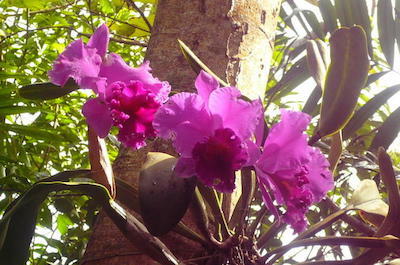 When you are searching for one of the newest eco-attractions on the island, then the perfect thing to do in St. Thomas is to visit the Phantasea Tropical Botanical Gardens. Located just north of Drake’s Seat on Hull Bay Road, the Phantasea Tropical Botanical Gardens have only been open since 2015. You will be awestruck at the plants that are going within this beautiful facility that is the creation of Patsy Breunlin. You can view a thousand varieties of orchids, numerous types of palm trees, gingers, agave, cactus heliconia and hundreds of bromeliads. You will have plenty of time to stroll through the gardens and rest at one of many benches as well as rest spots with decks that reside along the nature trails. Families will love the idea of going at your own pace as well as learning about the various eco-systems of St. Thomas and watching the native wildlife in its own habitat is a plus. If you like to mingle with locals and learn about culture through food, then the ideal thing to do in St. Thomas is to try a food tour. These excursions are great for many reasons including learning about the history of St. Thomas, talking to local merchants and tasting some incredible island delicacies. Food tours offer a walking atmosphere that is not rushed and there are usually a few cocktails associated with your meals. 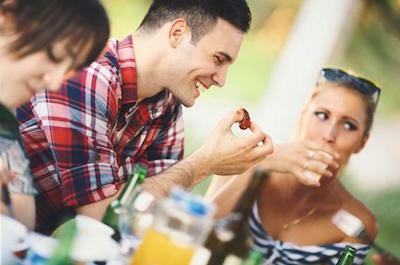 On your food tours in St. Thomas you will indulge in such culinary delights as conch fritters, creole, island slaw, fish tacos and barbeque meats as well as vegetables. An added bonus on these excursions is the opportunity to view intricate architecture as you listen to your expert guide. The inner foodie in you will thoroughly be pleased with the eating, drinking and history lesson that each excursion presents. If you want to try on of the hottest things to do in St. Thomas, then you need to go on a stand up paddleboarding excursion. 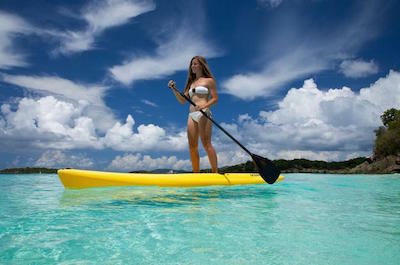 Stand up paddleboarding is a great way to view nature and you will be surprised at the wide variety of places you can go in St. Thomas. You can try stand up paddleboarding at Brewers Bay where the crowds are light or at the laid back Hull Bay as you combine a glorious snorkeling trip with your stand up paddleboard tour. Another excellent adventure on your stand up paddleboard is a glide through the Mangrove Lagoon where you can view hundreds of tiny red mangrove islands. There are opportunities to perform yoga on your stand up paddleboard as well as renting one for the day and creating your own excursion when you don’t want to be confined to a group. 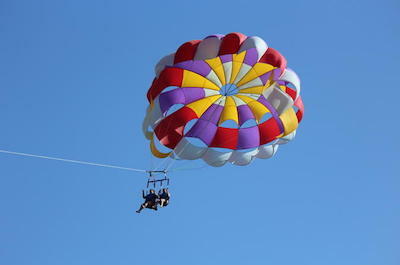 When you want to take off into the wild blue yonder, then the perfect thing to do in St. Thomas is to go parasailing. Your one hour excursion has several departure times throughout the day and begins when you meet your qualified captain at the Sapphire Beach Marina. Here you will check-in, sign a waiver and receive a briefing on how to properly use your parasail. 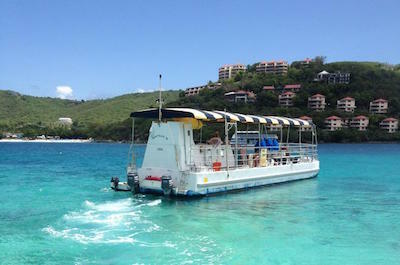 Once on the boat you will enjoy the ride and the views of St. Thomas from the water. When your turn approaches you will be outfitted with your harness and then gently lifted into the air. You will reach heights of over 500-feet as you gain a perfect aerial view of St. Thomas and the colorful Caribbean Sea. You will land back on the boat without touching water if you want to stay dry. Parasailing in St. Thomas can be great fun for the whole family and the boat ride is an added bonus. One of the more popular things to do in St. Thomas is to go on an eco-tour through the interesting waters of Mangrove Lagoon. You will be amazed by the sheer number of tiny red mangrove islands that dot the lagoon. 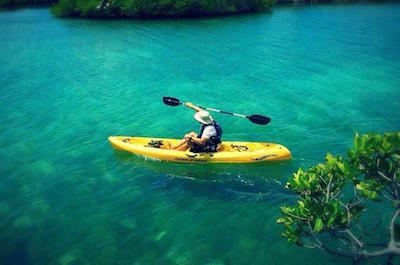 Most excursions are small groups that are traveling by kayak and families are encouraged to take one of the remarkable trips through the Mangrove Lagoon. You can travel during the day or take a spooky excursion in the evening while listening to pirate folklore. While you are paddling through the Mangrove Lagoon you will be pleased with the wildlife viewing that includes egrets, ducks and herons. You can also go snorkeling and snap a photo of stingrays, eels as well as brightly colored tropical fish. An added bonus on most excursions is a side trip to Cas Cay Island where the only inhabitants are hermit crabs. When you want to be immersed in nature, history and beautiful scenery, then the best thing to do in St. Thomas is to visit Hassel Island. Located on off the western edge of the harbor, Hassel Island was originally part of the larger peninsula until the 1860s when the Danish government wanted better water flow in the harbor. Today, Hassel Island is part of the Virgin Islands National Park and is a spectacular place to go hiking, snorkeling or kayaking. You can visit Hassel Island on a variety of tours that include kayaking from Frenchtown, hiking to Fort Willoughby and the snorkeling is second to none in the region. Families will be enthralled with a trip to Hassel Island which will take you back in time as you learn about the rich history of the Virgin Islands. The beautiful vantage points of Charlotte Amalie are spectacular from Hassel Island and are a must see for everyone visiting. When you are searching for things to do in St. Thomas and want to try something more laidback, then you should take a trip to Water Island. There are a variety of ways to visit Water Island that include a catamaran sail, kayaking or even by yacht. You can experience the excellent snorkeling at Honeymoon Beach where you will have the opportunity to swim with sea turtles while you view the beautiful coral reefs. Other activities on Water Island include a walk through Fort Segarra’s many watchtowers and tunnels. Water Island is lightly inhabited and development is sparse on the volcanic shorelines and you will find dive shops, ferry dock, a few food vendors and a beach bar. One of the best ways to get around Water Island is by bicycle where you will get a real up close feel for the laidback attitude of the island. 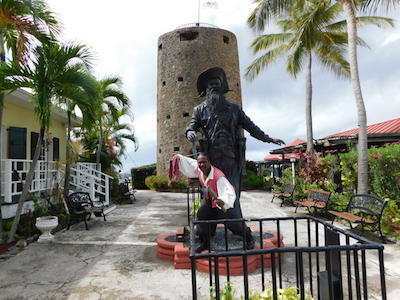 When you want to learn about the history of St. Thomas and the surrounding Caribbean area, then the best thing to do in St. Thomas is to visit Skytsborg Tower which is better known as Blackbeard’s Castle. Located on a hilltop overlooking the harbor, Blackbeard’s Castle is a spectacular structure that is situated on 5-acres of manicured gardens. You will be thoroughly pleased with the incredible views from the top of this circular structure that was constructed by the Danish in the 17th century as a military tower. You will learn important facts about the U.S. Virgin Islands as you walk the grounds of this National Register of Historic Places property. You can go for a swim in one of the three pools, gaze at the life-sized pirate sculptures or simply browse the three great houses that reside within the property and you will not be disappointed with the photograph opportunities. When you want to visit one of the more iconic buildings that is packed with history and culture, then the perfect thing to do in St. Thomas is to walk through Fort Christian. 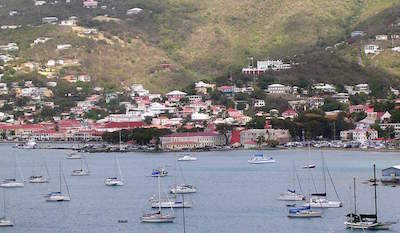 Located in the town of Charlotte Amalie, Fort Christian was constructed in 1672 by the Danish and has been a center piece within the city for centuries. You will be amazed at the intricate gothic-revival architectural style which graces the property. Inside you will find hundreds of exhibits that range from the Stone Age to early settlement to colonialism to the present day Caribbean area. Fort Christian is a prime example of Dutch-Caribbean construction and is the ideal setting for a museum with thousands of artifacts for you to view. There are a variety of tours that include a stop at Fort Christian as well as stops for shopping, sightseeing and the white sand beaches of St. Thomas. 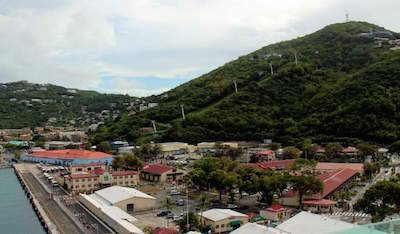 Mountain Top is one of the best things to do in St. Thomas for someone who likes to have a pristine panoramic view for photographs. Located overlooking Charlotte Amalie, Mountain Top has an elevation of over 2,100-feet above sea level and boasts views of 20 neighboring islands. Once you are on Mountain Top you will know why people have been enthralled with the beautiful views. You will also be happy with the variety of shopping choices like Reef, Guy Harvey, Panama Jack and Tommy Bahama that are now on Mountain Top. An added twist to the history of Mountain Top is the banana daiquiri is believed to be created here by George Coule in 1953. You can take as many photographs as you want while you gaze out over the island and browse for the perfect souvenir as you enjoy a refreshing banana daiquiri. If you want to find the perfect vantage point of panoramic views on the island, then the one thing to do in St. Thomas is to visit Drake’s Seat. Located on a hilltop overlooking Magens Bay, Drake’s Seat is a unique place to take in the breathtaking views of St. Thomas. 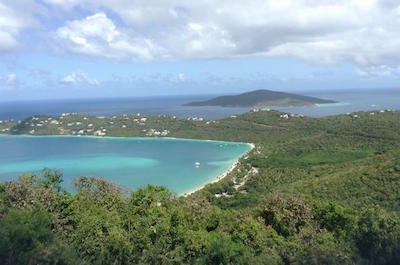 Many people believe that Sir Francis Drake would moor his boats in Magens Bay and climb the surrounding hilltops to look for enemy ships that were approaching. The bench known as Drake’s Seat was constructed by Arthur Fairchild in 1933 as he surveyed the hilltops by foot and on horseback. 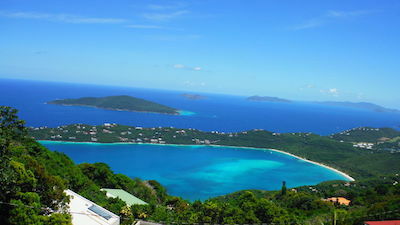 Drake’s Seat is a perfect spot to rest and enjoy the wonderful scenery of Magens Bay, the British Virgin Islands and St. Thomas. Visiting the 99 Steps is one of the more interesting things to do in St. Thomas while you walk the streets of the historic city of Charlotte Amalie. 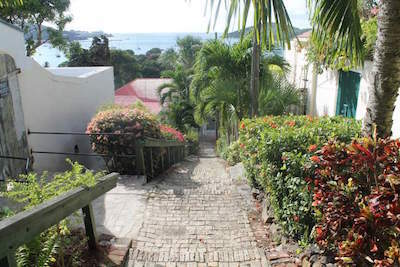 In the city of Charlotte Amalie step streets were created to help citizens navigate the hilly terrain of the city. There are literally hundreds of step streets but 99 Steps is by far the most recognizable of all. 99 Steps was constructed in the 1700s with bricks that were brought from Denmark and were used as ballast on the traveling ships. Today, when you climb 99 Steps you will enjoy a pathway surrounded by the lush greenery of flowers and trees. When you reach the top you will have actually climbed up 103 steps. 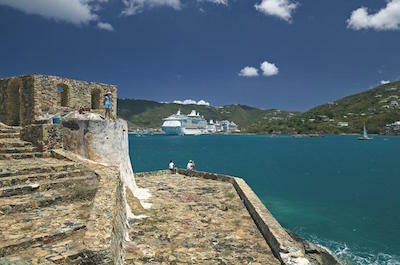 Once on top you can climb the remainder of steps to reach Blackbeard’s Castle which is one of three National Historic Landmarks on St. Thomas. If you have always wanted to visit a winter wonderland while in the Caribbean, then the perfect thing to do in St. Thomas is to visit the Magic Ice. Located in downtown Charlotte Amalie just a mere 2-miles from Crown Bay and Havensight, Magic Ice is a new sub-zero attraction that has some of the finest ice and snow sculptures in the world. This 10,000 square feet Scandinavian attraction provides all the necessary warm clothing for you to venture into the freezing temperatures to view the amazing sculptures that have been created by over 16 artists from around the world. Magic Ice is an ideal portrayal of the bond that exists between man and nature with all of the artwork being created below zero. The beauty of the carved transparent ice which is accented by lighting will thrill the whole family and take your artistic senses to new heights. Visiting Main Street in Charlotte Amalie is a great thing to do in St. Thomas for you to learn about the culture and food of the island as well as the being the premier place to shop. Main Street also known as Dronnigens Gade in Danish is the perfect place to shop with hundreds of little shops which are mostly duty-free. You can find diamonds, perfumes, designer clothing and even watches at discount prices. There are several restaurants and bars that will help when you get thirsty or hungry. Main Street can be busy during peak cruise ship periods but many locals claim the best time to shop on Main Street is 3P.M. in the afternoon. If you get tired of shopping there is Market Square and Emancipation Garden nearby which are great for photograph opportunities. The Marina at Yacht Haven Grande is one of the world’s best luxury yacht marinas which also sports world class amenities. 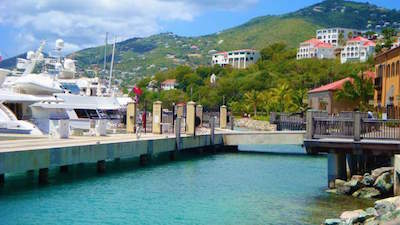 Visiting Marina at Yacht Haven Grande is a logical thing to do in St. Thomas when you are sailing or traveling around the U.S. Virgin Islands. 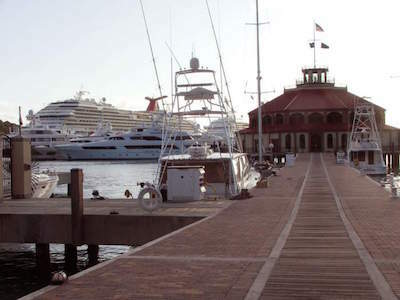 Located adjacent to Charlotte Amalie Harbor, The Marina at Yacht Haven Grande can accommodate 46 mega yachts or sailing vessels or sport fishers. The list of amenities is awesome which includes a fitness center, laundry, and catering as well as fueling. This marina can accommodate vessels up to 650-feet in length. The Marina at Yacht Haven Grande also boasts fine shopping with venues like Coach, bebe and Gucci as well as duty-free shopping at Diamond International. Other options at Marina at Yacht Haven Grande include dining at the Fresh Bistro, the Fat Turtle and Grande Cru. Market Square is the perfect thing to do in St. Thomas when you want to mix history with a thriving modern day produce market. Market Square also known as the Rothschild Francis Market has been in existence since at least 1836 when the location was first put on a map. Over the centuries Market Square has gone from being a slave selling market to a fresh farmer’s produce market. There is a large cast iron bungalow which was constructed sometime in 1904 where many of the present day vendors sell their fruits and crafts. In the past Market Square was operated by three flamboyant women and very seldom was there a male vendor inside the bungalow. Market Square is a great resting point while touring the historic streets of Charlotte Amalie and also offers great photograph opportunities. 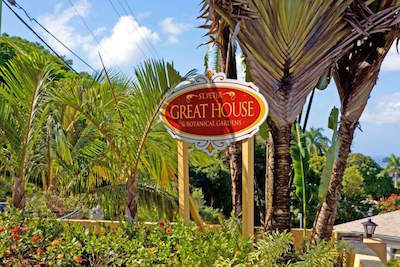 St. Peter Great House and Botanical Gardens is a perfect thing to do in St. Thomas for families and couples who are searching an interesting view of early island life. Located in the northern portion of the island, the St. Peter Great House and Botanical Gardens was originally part of the 150-acre Plantation St. Peter. The St. Peter Great House and Botanical Gardens are a showcase of 17th century architecture as well as a preserve for some 300 species of native plants to the U.S. Virgin Islands. The botanical gardens are situated on 2.5-acres of beautifully manicured landscape which are home to over 20 species of orchids, waterfalls, and fish ponds. 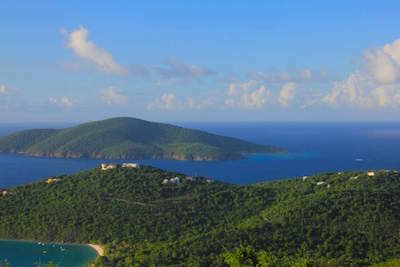 There is a spectacular observation deck that allows you to see more than 15 other Virgin Islands and nearby Cays. Another plus at the St. Peter Great House and Botanical Gardens is the Blue Orchid Restaurant which is open nightly with gourmet dining and a traditional brunch is available on the weekends. The Yacht Haven Grande is one of the world’s best luxury accommodations for yachts and boasts a tremendous amount of world class amenities. Most captains find that visiting Yacht Haven Grande is a smart thing to do in St. Thomas when you are sailing or traveling around the U.S. Virgin Islands. Located adjacent to Charlotte Amalie Harbor, The Yacht Haven Grande can accommodate 46 mega yachts or sailing vessels or sport fishers. The list of amenities is awesome which includes a fitness center for Zumba or yoga classes, laundry facilities, and personal catering. The Yacht Haven Grande also boasts fine shopping with venues like Louis Vuitton, Salvatore Ferragamo and Bvlgari as well as duty-free shopping at Diamond International. Other options at Yacht Haven Grande include dining at the Fat Turtle, Grande Cru and Fresh Bistro. The American Yacht Harbor is one of the best marinas and a great thin to do in St. Thomas when you are searching for a quality harbor on the east end of St. Thomas. Located within Vessup Bay, the American Yacht Harbor has 105 fixed slips with the ability to handle water craft up to 110-feet in length that have no more than a 10-feet draft. The American Yacht Harbor has unique and world class amenities which include shopping, dining, personal services and lots of entertainment venues. The marina can handle almost every type of water vessel from a yacht to sail boats to speed boats to fishing boats. You can also find a number of charter companies offering a variety of water-based tours of the area. There are nine restaurants within the harbor that serve everything from burgers at Tap and Still to pub fare at Malone’s Irish Pub to spectacular gourmet cuisine at Revelry Dockside Restaurant.